On July 1, TRU will acquire full-ownership of the McGill Road student residences from the Sanesh family. The $9 million used to purchase the building comes directly from TRU’s capital project reserves. “It is coming from the accumulated surpluses of our capital reserves. So we are not taking any debt over the purchasing of this property,” said Matt Milovick, TRU’s VP Finance. The buildings, which were previously owned by the Sanesh family, were 27 years into a 60-year lease. After the death of Josephine Theresa Sanesh last September, her three children inherited the business. Bruce Gysel, husband of Theresa Sanesh (Gysel) described Josephine Sanesh’s passing as the “trigger point” in the decision to continue on or sell to the university. It wasn’t until late September 2015, when Bruce Gysel was at TRU for a business kickstarter speaker series, that TRU made any real moves to discuss the nature of the arrangement. Campus Living Centres, the company TRU contracts to run the TRU Residence, will begin managing the McGill Residence as well come July. “The advantage we see with Campus Living Centres contracting out, is that we have a fairly robust residence life program at the TRU Residence. It works well with our dean of students and we wanted a continuation of that program at the McGill Residence,” Milovick said. Though the residences don’t exactly fit in with the university’s master plan and TRU’s idea for a university village, Milovick believes they will remain standing for another five to ten years. Once TRU takes possession on July 1, they will survey the buildings to see what improvements may need to be made. One of the first things to be done by TRU will be the improvement of the residence’s high-speed internet, Milovick said. 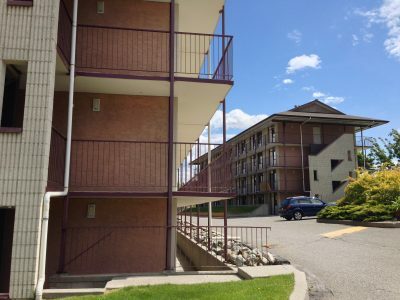 Though the university may eventually tear down the 28-year-old residences in order to redevelop the site and construct something more modern, Milovick wants to make sure that TRU has the inventory to replace all the beds and other furniture that will be lost. “When it is time to knock it down, we will knock it down and build something more contemporary. Until then it is business as usual in the meantime,” Milovick said.